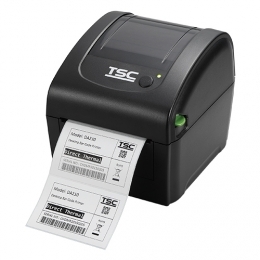 TSC DA210/DA220 Receipt and Label 203dpi or 300 dpi Desktop Printers offers a choice of four economical desktop printers for receipts and labels - depending on which resolution and maximum print length you prefer. All the models work with receipt and label rolls up to 4.5’’ wide. With their compact form and high print speed of 152.4 mm per second, they are just as well suited for the POS as well as for shipping departments, office & marketing applications and for the generation of event & transportation tickets. Depending on the model the print quality is 203 or 300 dpi. • Desktop devices with a high print speed: 152.4 mm/sec.